But I’ve seen people shift over there almost immediately. I mean, like, rep two out of twenty. They know how to do the exercise, they just can’t. Their brains won’t let them. Why? Because ‘dey scared. I practicing distinguishing between pain and discomfort every day of my life. Sometimes for myself, but usually for clients. I have had chronic pain in the past. In fact, I still have bad days relatively frequently. I don’t want anyone to end up like me. So when a client says that something hurts, I stop, collaborate, and listen. I’m sensitive to this subject, and if you say things hurt, I’m much more likely to baby you. But that just makes me part of the problem. There’s this cliché that “pain is weakness leaving the body”. Most of us hoity toity trainers make fun of that phrase. It forgets the nuance that sometimes pain is a bad thing and needs to be avoided. It downplays science and suggests that all you need is to try harder. It’s often associated with terrible lifting technique and trainers screaming at clients. But it’s true. At least in some sense. We’re not talking about joint pains or muscle strains. We’re talking about (practice) muscle burn. The kind of muscle burn that accompanies exercising to the muscle’s limit. And it IS painful. Especially if it’s unfamiliar. Whoa! What was that! Better not let that happen again. Our mind is trying to preserve our body. If those muscle gas out, you won’t be able to defend yourself. Better to look like Quasimodo than to be dead. If you’re my client, you better show me that you can pedal for a mile straight on a fan bike. Or climb an uninterrupted 300 feet on the Versaclimber. Show me someone who can’t sustain physical activity and I’ll show you someone with poor technique. Good positions sometimes require strength to get into and endurance to maintain. And if you start feeling that burn, your brain is trying to get you to avoid it. Shift away, conserve resources. So they shift. They shift forward, they arch their back, or they favor one side. They turn their chest in their bench press. They stick their left knee out further on their squats. The shift to their right leg in their deadlifts. They shift to avoid the noxious feeling of muscle burn. Because they are weak-minded, at least in this moment. They can’t tolerate the pain. People with persistent pain, people coming out of rehab, and people with various movement dysfunctions need to set aside their goals for a few months and train like a bodybuilder. They need to feel the burn. They need the mind-muscle connection. They need to relish the DOMS and learn how to push themselves. Your mind is an overprotective parent, just like I can be with my clients. You need to let your body play around. Lift with a slow tempo. Don’t pause. Keep moving and keep breathing. 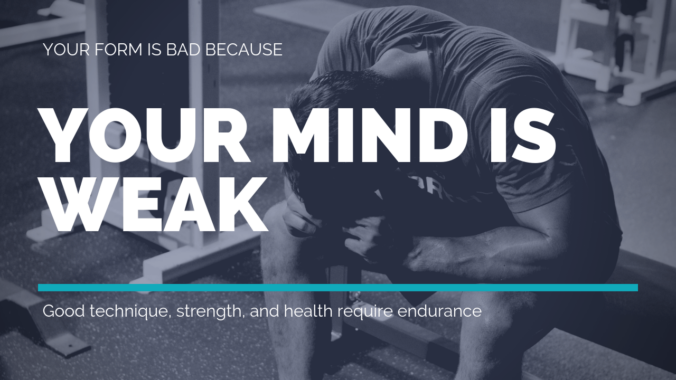 Focus on your leg burn, not your back position or whatever other worry hijacks your mind. Slowing it down gives you time to think through it, feel what’s going on, and forces you to get comfortable. It also forces you to have to breathe. You can’t hold your breath here, you need to keep moving… your joints, your lungs, and your cardiovascular system. Continuous breathing means continuous gas exchange. Clear out the CO2. Fill in the O2. Build the mitochondria. I look at everything through a learning perspective. You need to learn what it feels like to grind through a heavy rep. You need to learn what it feels like to have your legs burn at the end of a set. You need to learn what it feels like to get in a good deadlift position. So that burn is just gradual exposure to something noxious that will soon be innocuous. Endurance allows me to fight off the fatigue, hold a good position, and load muscles well. It allows me to grind out heavy, slow reps without using my back. It keeps things together while you push into the performance realm. Are you letting yourself wimp out? Are you doing your cardio regularly? If not, make sure you clear that up before you blame your movement dysfunction on your scoliosis or whatever.